Danny warned Reuben against it, but Reuben is a man of pride, of status, he’s a man who wants to be back in the casino business. Which is why he set aside his principles and went into partnership with Willy Bank, owner of a whole chain of hotels, and who is soon to open the biggest and best new establishment in Las Vegas. Willy Bank is venal, avaricious, unprincipled, and worst of all, he lacks taste. Naturally he muscled Reuben out of his share of the deal, a manoeuvre that gave poor Reuben a heart attack. So now Danny is putting together the crew to get some measure of vengeance against Willy Bank, and $500 million on his new casino’s opening night is a pretty hefty measure. It’s the most intricate and complex plan yet, and it will need a good amount of seed capital. It means going to the last person on earth they can think of for help; it means going to Terry Benedict. I owe Warner Brothers an apology, kind of. When I reviewed the DVD, I made some noise about companies at that time deliberately compromising the quality of DVD transfers to make the fledgling HD versions look even more attractive. Having now seen the Blu-ray of Ocean’s Thirteen I have to admit that I was wrong. The 2.40:1 widescreen transfer is adequate, with no issues with compression or similar to worry about. The image is clear and sharp, while detail levels are a step up from the DVD. But the source material is horrendous. The least of its problems are the black crush, and lack of shadow detail, which given that this is the darkest Oceans movie, is a significant issue. But it’s been filtered to hell and back, it would be an orange and teal nightmare if there was any teal in it, and most of the characters’ skin tones look like Donald Trump’s after he’s been dipped in Fanta, Irn Bru and Lucozade. If the colours in this film were any more saturated, you’d be watching A Scanner Darkly. You have the choice between lossy DD 5.1 English, French, and Spanish with subtitles in these languages plus Japanese, Korean, and Portuguese. The dialogue is clear, the surround is adequate, and the music is almost as good as the first film’s. Of course you’ll have to turn up the volume a tad to get the most out of it. The disc autoplays the movie again, no main menu, but a pop-up menu to access scene select, audio options, and extras, and once the film ends, the disc loads up an extras menu. In common with the UK DVD release, you’ll find the Vegas: An Opulent Illusion featurette, which lasts 22:47, and the Jerry Weintraub Walk and Talk featurette running to 2:25, both in SD. For the first time, the additional footage on this disc, 4:36 worth is presented in HD. Exclusive to the BD disc, you get a Masters of the Heist documentary, which looks at some real life confidence tricksters in history, including the eponymous Ponti. This lasts 44:02 SD. You also get an audio commentary for the film, with Steven Soderbergh joined by screenwriters Brian Koppelman and David Levien. 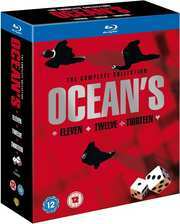 Ocean’s Twelve got a pretty dismal critical reception, in fact as I recall, it was derided as a stinker by most critics, self-indulgent and flat, and I’m sure that afterwards there must have been some kind of head-scratching as to just what went wrong. When it came to Ocean’s Thirteen, there must have been a temptation to go back to what had worked, to stick to the strengths of the franchise. Which is probably why Ocean’s Thirteen plays as a remake of Ocean’s Eleven. It’s another casino heist in Las Vegas; it’s once more motivated by revenge, and once more, a group of amiable, good-natured crooks get together to swindle a mean-spirited and slimy crook. It’s fun, it’s entertaining, and it kept my bum glued to my seat, and my eyes averted from any clocks, watches, sundials or timepieces for the duration. Ocean’s Thirteen is also a pale shadow of the original (remake) movie, lacking in energy, vitality, and excitement. It has all the signs of franchise fatigue, of going through the motions, of relying on familiarity more than originality. The main problem is cast bloat. It’s hard enough to have eleven central characters, but with Ocean’s Thirteen referencing the previous and the first movies, there’s no room for character development at all. It really just feels like an extended sequence of cameos, and there’s certainly not enough space to develop an antipathy for Pacino’s Willy Bank, in the way there was for Terry Benedict in the first film. That’s even with this third film ditching Tess and the Catherine Zeta Jones character from the second film. Also, there is never that edge of peril there was in the first film. With Ocean’s Eleven, you always had the inevitability of consequences, should Danny and his crew get caught. There was a genteel malice to the Benedict character, and the possibility was there that things could go wrong. Part of that is due to the aforementioned character development, but part of it was that Ocean’s Eleven played it comparatively straight. With Ocean’s Thirteen’s lack of character development removing the malice, it certainly didn’t need comedy gimmicks like false noses and itching powder thrown into the mix. I stayed resolutely away from the edge of my seat for this film. Another disappointment is that there are no surprises in this film. The first film had twists and reversals, little flashbacks and asides that revealed little ‘Oh Wow!’ moments throughout the movie. And then right at the end, there’s a great big revelation, as the wool is finally pulled away from your eyes and you realise how it was actually done. In Ocean’s Thirteen, they tell us what they are going to do and how, they then proceed to do what they planned, they come up against obstacles and reversals which they resolve, and other than one minor plot twist, it all goes pretty much by the book. Which, let’s face it, isn’t what you want to see a heist movie for. Fortunately the familiarity of the characters, the pace and the liveliness of the script do much to cancel out this shortcoming. Ocean’s Thirteen is a fun little movie, entertaining enough to keep the attention, and providing just enough satisfaction that you don’t lament the loss of two hours of your life. While it may have a good few flaws to it, it still has a top quality cast, and let’s face it, where else are you going to see George Clooney looking like Freddie Mercury? But thematically, the franchise looks tired, and compared to the first film, this third one is verging on self-parody. I might have breathed a sigh of relief when no Ocean’s Fourteen was forthcoming, but I didn’t reckon on this era’s trend towards gender-switching. We now have Ocean’s Eight to look forward to/dread.